Name Variation Marith Larsdatter Kongsvik was also known as Marit. Name Variation Marith Larsdatter Kongsvik was also known as Larson. Married Name 21 April 1892 As of 21 April 1892,her married name was Bodeberg. Married Name 21 April 1892 As of 21 April 1892,her married name was Bosberg. She was the daughter of Lars Olsen Lykken and Berit Johnsdatter Stene. Marith Larsdatter Kongsvik died in 1929 at Bodsberg Ostre, Byneset, Sør-Trøndelag, Norway. 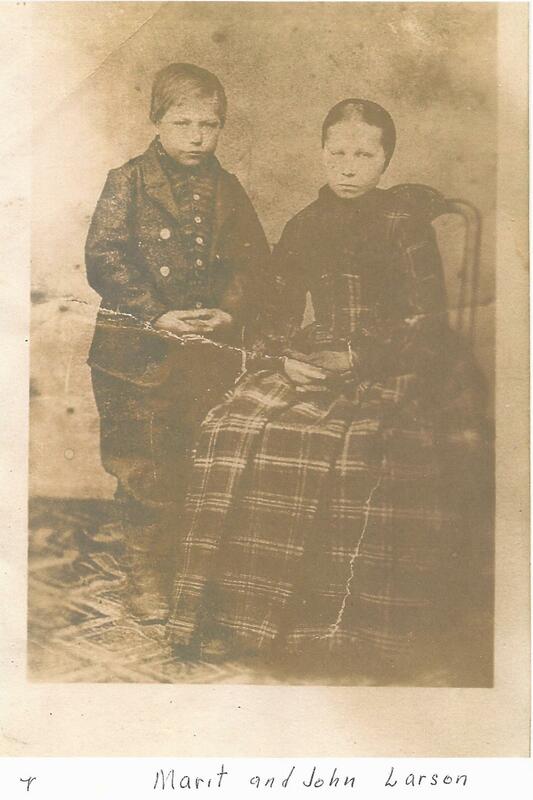 Circa 1870 at Norway portrait of siblings Marit and John Larson. [S375] Norwegian National Archives Digital Archives, by Norwegian government, Church book from Byneset parish, Byneset local parish 1878-1897 (1655P). List: Fødte og døpte b 1846-1859. [S375] Norwegian National Archives Digital Archives, by Norwegian government, 1900 census for Byneset. [S375] Norwegian National Archives Digital Archives, by Norwegian government, 1910 census for Byneset. [S375] Norwegian National Archives Digital Archives, by Norwegian government, Church book from Byneset parish 1859-1877 (1655P). Married Name circa 1927 As of circa 1927,her married name was Robinett. Marguerite (?) was born on 4 July 1902 at Kentucky. She married Barney E. Robinett, son of James Edward Robnett and Louisa Mary Harrison, circa 1927. Marguerite (?) died on 28 July 1996 at age 94. Marguerite (?) obtained US Social Security Card at Illinois; last residence Metropolis, Massac, Illinois. [S250] U.S. Federal Census 1930 U.S. Federal Census, by Ancestry.com, ED61-13. Dwelling 22. Name Variation Halsie E. Robinett was also known as Halsey. Name Variation Halsie E. Robinett was also known as Robinette. Name Variation Halsie E. Robinett was also known as Hal. Halsie E. Robinett married Mary Frances Marshall, daughter of Benjamin Franklin Marshall and Lula Lee Benefield. Halsie E. Robinett was born on 5 July 1920 at McCracken, Kentucky. He was the son of Harley E. Robinett and Hassie V. Philpott. Halsie E. Robinett died on 14 November 1991 at McCracken, Kentucky, at age 71. [S250] U.S. Federal Census 1930 U.S. Federal Census, by Ancestry.com, ED73-18. Dwelling 169. [S373] U.S. Federal Census 1940 U.S. Federal Census, by Ancestry.com, Year: 1940; Census Place: , McCracken, Kentucky; Roll: T627_1335; Page: 13B; Enumeration District: 73-32. Name Variation Max L. Robinett was also known as Robinette. Max L. Robinett was born on 1 October 1927 at McCracken, Kentucky. Max L. Robinett died in 1994. Married Name circa 1919 As of circa 1919,her married name was Zintz. Lillian (?) was born circa 1902 at South Dakota. She married Fountain Samuel Zintz, son of Henry W. Zintz and Eudora Derrickson, circa 1919. [S243] U.S. Federal Census 1920 U.S. Federal Census, by Ancestry.com, ED78. Dwelling 179. [S250] U.S. Federal Census 1930 U.S. Federal Census, by Ancestry.com, ED13-90. Dwelling 361. Name Variation Fountaine Samuel Zintz Jr. was also known as Fountain R.
Fountaine Samuel Zintz Jr. was born on 13 November 1921 at Wisconsin. He was the son of Fountain Samuel Zintz and Lillian (?). On 5 October 1942 at U.S. World War II Army Enlistment, Cook, Illinois, Name: Fountain R Zintz Birth Year: 1921 Race: White, citizen (White) Nativity State or Country: Wisconsin State: Illinois County or City: Cook Enlistment Date: 5 Oct 1942 Enlistment State: Illinois Enlistment City: Chicago Branch: Branch Immaterial - Warrant Officers, USA Branch Code: Branch Immaterial - Warrant Officers, USA Grade: Private Grade Code: Private Term of Enlistment: Enlistment for the duration of the War or other emergency, plus six months, subject to the discretion of the President or otherwise according to law Component: Selectees (Enlisted Men) Source: Civil Life Education: 1 year of college Marital Status: Single, without dependents Height: 66 Weight: 115. Name Variation Christopher Columbus Derrickson was also known as Columbus. Name Variation Christopher Columbus Derrickson was also known as Lum. Name Variation Christopher Columbus Derrickson was also known as C. C.
Christopher Columbus Derrickson was born on 26 November 1844 at Indiana. He was the son of Thomas P. Derrickson and Rachel Leah Chew. Christopher Columbus Derrickson married Mary Etta Parker on 4 April 1867. Christopher Columbus Derrickson died on 1 November 1927 at age 82. [S248] U.S. Federal Census 1860 U.S. Federal Census, by Ancestry.com, Dwelling 699. Page 77. Stamp 135. [S247] U.S. Federal Census 1870 U.S. Federal Census, by Ancestry.com, Page 12. Dwelling 91. [S246] U.S. Federal Census 1880 U.S. Federal Census, by Ancestry.com, ED236. NA Film Number T9-1445. Sheet 92A. [S245] U.S. Federal Census 1900 U.S. Federal Census, by Ancestry.com, ED115. Dwelling 95. [S244] U.S. Federal Census 1910 U.S. Federal Census, by Ancestry.com, ED94. Dwelling 148. [S243] U.S. Federal Census 1920 U.S. Federal Census, by Ancestry.com, ED201. Dwelling 107. Name Variation Fountain G. Derrickson was also known as Fount. Fountain G. Derrickson was born in May 1870 at Wisconsin also reported as Jun 1870. He was the son of Christopher Columbus Derrickson and Mary Etta Parker. Fountain G. Derrickson married Isabell Short, daughter of Henry Short and Sarah A. (? ), circa 1897 Fountain's first marriage, Isabell's second. Fountain G. Derrickson and Isabell Short were divorced before 1920. 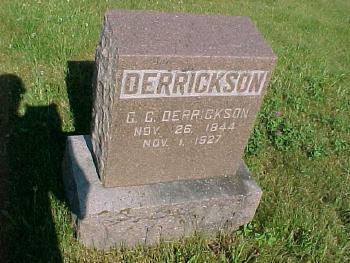 Fountain G. Derrickson died after April 1930. [S245] U.S. Federal Census 1900 U.S. Federal Census, by Ancestry.com, ED115. Dwelling 147. [S244] U.S. Federal Census 1910 U.S. Federal Census, by Ancestry.com, ED94. Dwelling 166. [S250] U.S. Federal Census 1930 U.S. Federal Census, by Ancestry.com, ED25-3. Dwelling 73. Married Name 4 April 1867 As of 4 April 1867,her married name was Derrickson. Mary Etta Parker was born on 28 September 1848 at New York. She married Christopher Columbus Derrickson, son of Thomas P. Derrickson and Rachel Leah Chew, on 4 April 1867. Mary Etta Parker died on 4 January 1920 at age 71. Mary Etta Parker had 8 with 7 living in 1900 children. She had 7 children with 7 living in 1910 children. Arlouie Derrickson was born circa 1875 at Wisconsin. She was the daughter of Christopher Columbus Derrickson and Mary Etta Parker. Arlouie Derrickson died after 1910. Name Variation Emolyn Derrickson was also known as Linnie. Name Variation Emolyn Derrickson was also known as Lynette. Name Variation Emolyn Derrickson was also known as Emmie. Emolyn Derrickson was born in October 1877 at Wisconsin. As of 1930, Emolyn Derrickson was never married. [S244] U.S. Federal Census 1910 U.S. Federal Census, by Ancestry.com, ED39. Dwelling 14. [S243] U.S. Federal Census 1920 U.S. Federal Census, by Ancestry.com, ED163. Dwelling 80. [S250] U.S. Federal Census 1930 U.S. Federal Census, by Ancestry.com, ED52-9. Dwelling 159. Thomas Parker Derrickson was born in February 1880 at Wisconsin. Thomas Parker Derrickson married Maude L. Watson circa 1903. Thomas Parker Derrickson died in 1937. [S244] U.S. Federal Census 1910 U.S. Federal Census, by Ancestry.com, ED94. Dwelling 149. [S243] U.S. Federal Census 1920 U.S. Federal Census, by Ancestry.com, ED204. Dwelling 67. [S250] U.S. Federal Census 1930 U.S. Federal Census, by Ancestry.com, ED52-18. Dwelling 145. Name Variation Hubert S. Reagles was also known as Ragles. Hubert S. Reagles was born on 23 September 1856 at Richland, Wisconsin, twin with Augustus. birth listed as 23 Sept 1857. He was the son of Abel Reagles and Priscilla E. Sippy. Hubert S. Reagles married Christina F. Leiber, daughter of John Leiber and Elizabeth (? ), on 11 November 1888. Hubert S. Reagles died on 26 November 1929 at age 73. [S248] U.S. Federal Census 1860 U.S. Federal Census, by Ancestry.com, Page 114. Dwelling 518. [S247] U.S. Federal Census 1870 U.S. Federal Census, by Ancestry.com, Page 31. Stamp 654. Dwelling 227. [S246] U.S. Federal Census 1880 U.S. Federal Census, by Ancestry.com, ED236. NA Film Number T9-1445. Stamp 100B. [S245] U.S. Federal Census 1900 U.S. Federal Census, by Ancestry.com, ED115. Dwelling 161. [S244] U.S. Federal Census 1910 U.S. Federal Census, by Ancestry.com, ED94. Dwelling 40. [S243] U.S. Federal Census 1920 U.S. Federal Census, by Ancestry.com, ED201. Dwelling 50. Name Variation Clarence Jay Reagles was also known as C. J. 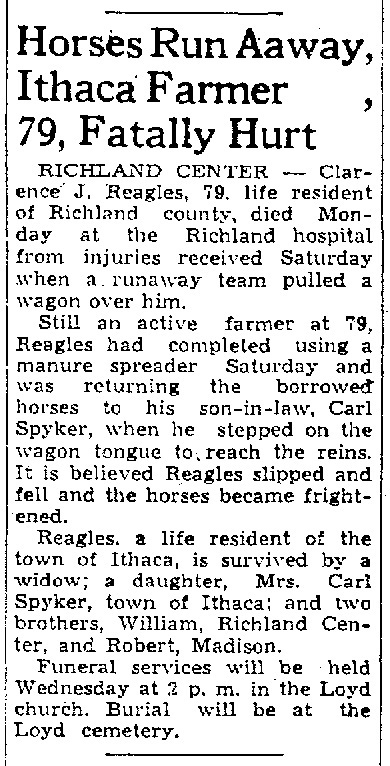 Name Variation Clarence Jay Reagles was also known as Richard Reagles. Clarence Jay Reagles was born on 4 July 1859 at Richland, Wisconsin. Clarence Jay Reagles married Jeanette Elvina Sippy, daughter of John Griffin Sippy and Amanda Melvina Lawrence, on 17 September 1882 at Richland, Wisconsin. Clarence Jay Reagles died on 5 December 1938 at Richland, Wisconsin, at age 79 Clarence J Reagles obituary. [S245] U.S. Federal Census 1900 U.S. Federal Census, by Ancestry.com, ED115. Dwelling 151. [S244] U.S. Federal Census 1910 U.S. Federal Census, by Ancestry.com, ED94. Dwelling 44. [S243] U.S. Federal Census 1920 U.S. Federal Census, by Ancestry.com, ED201. Dwelling 53. [S250] U.S. Federal Census 1930 U.S. Federal Census, by Ancestry.com, ED52-9. Dwelling 4. Name Variation Robert B. Reagles was also known as Ragles. Robert B. Reagles was born on 12 July 1861 at Richland, Wisconsin. Robert B. Reagles married Josie A. (?) circa 1885. Robert B. Reagles married Verna L. Gilmore on 19 October 1904. Robert B. Reagles and Verna L. Gilmore were divorced before 1930. Robert B. Reagles died on 3 February 1940 at age 78. Robert B. Reagles was a doctor in 1900. [S245] U.S. Federal Census 1900 U.S. Federal Census, by Ancestry.com, ED115. Dwelling 168. [S244] U.S. Federal Census 1910 U.S. Federal Census, by Ancestry.com, ED10. Dwelling 42. [S243] U.S. Federal Census 1920 U.S. Federal Census, by Ancestry.com, ED1. Dwelling 168. [S250] U.S. Federal Census 1930 U.S. Federal Census, by Ancestry.com, ED1. Dwelling 186. 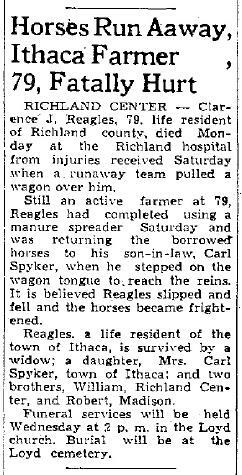 Name Variation Thomas Jefferson Reagles was also known as Ragles. Thomas Jefferson Reagles was born on 31 July 1848 at Wabash, Indiana. Thomas Jefferson Reagles married Martha A. Church, daughter of Lester G. Church and Lucy B. Page, on 20 April 1873. Thomas Jefferson Reagles died on 15 August 1927 at Brown, South Dakota, at age 79. [S249] U.S. Federal Census 1850 U.S. Federal Census, by Ancestry.com, Page 398. Dwelling 107. [S245] U.S. Federal Census 1900 U.S. Federal Census, by Ancestry.com, ED55. Dwelling 36. Name Variation Martha A. Church was also known as Mattie A. Married Name 20 April 1873 As of 20 April 1873,her married name was Reagles. Martha A. Church was born on 24 August 1856 at Wheeling Prairie, Wisconsin. She was the daughter of Lester G. Church and Lucy B. Page. Martha A. Church married Thomas Jefferson Reagles, son of Abel Reagles and Priscilla E. Sippy, on 20 April 1873. Martha A. Church died on 5 October 1928 at Groton, Brown, South Dakota, at age 72. Martha A. Church had 2 with 2 living in 1900 children. [S247] U.S. Federal Census 1870 U.S. Federal Census, by Ancestry.com, Page 31. Stamp 654. Dwelling 225. Name Variation Adelbert H. Reagles was also known as Delbert H.
Adelbert H. Reagles was born in January 1874 at Wisconsin. He was the son of Thomas Jefferson Reagles and Martha A. Church. Name Variation Isabell Short was also known as Belle. Married Name circa 1897 As of circa 1897,her married name was Derrickson. Isabell Short was born in April 1870 at Wisconsin. She was the daughter of Henry Short and Sarah A. (?). Isabell Short married Fountain G. Derrickson, son of Christopher Columbus Derrickson and Mary Etta Parker, circa 1897 Fountain's first marriage, Isabell's second. Isabell Short and Fountain G. Derrickson were divorced before 1920. Isabell Short had zero children. [S246] U.S. Federal Census 1880 U.S. Federal Census, by Ancestry.com, NA Film Number T9-1445 Sheet 96A. Henry Short married Sarah A. (?). Henry Short was born on 13 November 1836 at England. He was the son of John P. Short. Henry Short died on 27 August 1923 at age 86. [S220] Tales the Tombstone Tells, online http://www.monticellowi.com/RichlandCo/TalesPage66.htm, page 67. Donald Scholl Reagles married Dora Webster. Donald Scholl Reagles was born on 29 June 1904 at Neptune, Richland, Wisconsin. He was the son of William Shakespeare Reagles and Louise (?). Donald Scholl Reagles died on 5 October 1990 at Richland, Wisconsin, at age 86 also reported as 02 Oct 1990; Donald Scholl Reagles obituary. Donald Scholl Reagles obtained US Social Security Card at Wisconsin; last residence not specified. [S243] U.S. Federal Census 1920 U.S. Federal Census, by Ancestry.com, ED205. Dwelling 45. Name Variation Jeanette Elvina Sippy was also known as Nettie E.
Name Variation Jeanette Elvina Sippy was also known as Janette. Married Name 17 September 1882 As of 17 September 1882,her married name was Reagles. Jeanette Elvina Sippy was born on 1 February 1861 at Richland, Wisconsin, also reported to be born in Pennsylvania. She was the daughter of John Griffin Sippy and Amanda Melvina Lawrence. 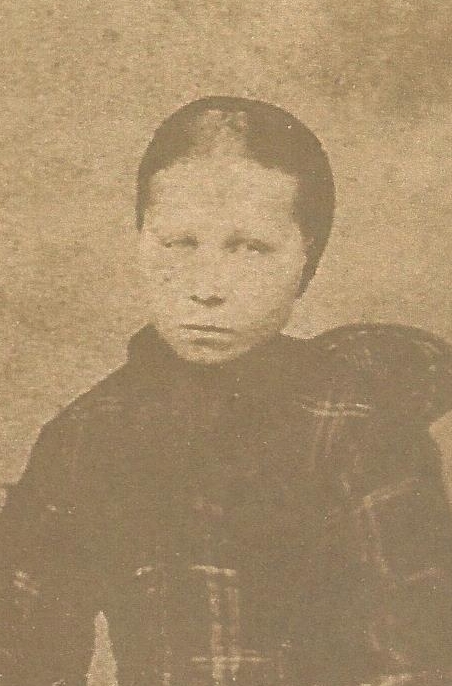 Jeanette Elvina Sippy married Clarence Jay Reagles, son of Abel Reagles and Priscilla E. Sippy, on 17 September 1882 at Richland, Wisconsin. Jeanette Elvina Sippy died on 16 February 1940 at Richland, Wisconsin, at age 79. Jeanette Elvina Sippy had 1 with 1 living in 1910 children. [S247] U.S. Federal Census 1870 U.S. Federal Census, by Ancestry.com, Page 39. Stamp 527. Dwelling 307. [S246] U.S. Federal Census 1880 U.S. Federal Census, by Ancestry.com, NA Film Number T9-1445 Page Number 203C. Married Name 11 November 1888 As of 11 November 1888,her married name was Reagles. Christina F. Leiber was born on 28 June 1870 at Illinois. She was the daughter of John Leiber and Elizabeth (?). Christina F. Leiber married Hubert S. Reagles, son of Abel Reagles and Priscilla E. Sippy, on 11 November 1888. Christina F. Leiber died on 4 June 1955 at age 84. Christina F. Leiber had 2 with 1 living in 1900 children. [S250] U.S. Federal Census 1930 U.S. Federal Census, by Ancestry.com, ED52-9. Dwelling 5. Name Variation Irvin S. Reagles was also known as Irving S.
Irvin S. Reagles was born in October 1890 at Wisconsin. He was the son of Hubert S. Reagles and Christina F. Leiber. Irvin S. Reagles married Lena B. (?) circa 1919. Irvin S. Reagles died before 1940. [S243] U.S. Federal Census 1920 U.S. Federal Census, by Ancestry.com, ED201. Dwelling 46. [S250] U.S. Federal Census 1930 U.S. Federal Census, by Ancestry.com, ED52-9. Dwelling 2. 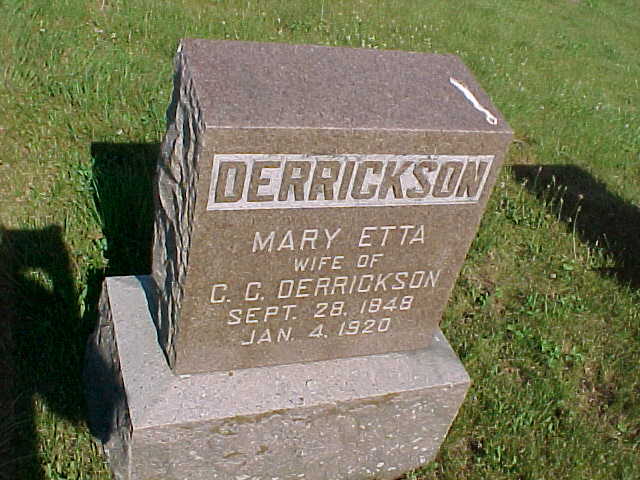 Married Name circa 1903 As of circa 1903,her married name was Derrickson. Maude L. Watson was born in 1877 at Wisconsin. She married Thomas Parker Derrickson, son of Christopher Columbus Derrickson and Mary Etta Parker, circa 1903. Maude L. Watson died in 1966. Archie R. Derrickson was born on 13 December 1903 at Wisconsin. He was the son of Thomas Parker Derrickson and Maude L. Watson. Archie R. Derrickson married Delia E. Laufenberg on 5 August 1948. Archie R. Derrickson died on 28 October 1985 at age 81. [S201] Unknown subject Cemetery Records, by unknown photographer. [S250] U.S. Federal Census 1930 U.S. Federal Census, by Ancestry.com, ED52-17. Dwelling 64. Claude L. Derrickson was born circa 1906 at Wisconsin. Claude L. Derrickson died before June 2009. Amy L. Derrickson was born circa 1907 at Wisconsin. She was the daughter of Thomas Parker Derrickson and Maude L. Watson. Amy L. Derrickson died before June 2009. Norman Earl Derrickson was born on 5 July 1910 at Wisconsin. Norman Earl Derrickson died on 18 September 1986 at age 76. Dorothy J. Derrickson was born circa 1915 at Wisconsin. Dorothy J. Derrickson died before June 2009.